We are soooo excited to share this one-of-a-kind nursery designed by baby Everly's mama, Nicole Blattner. 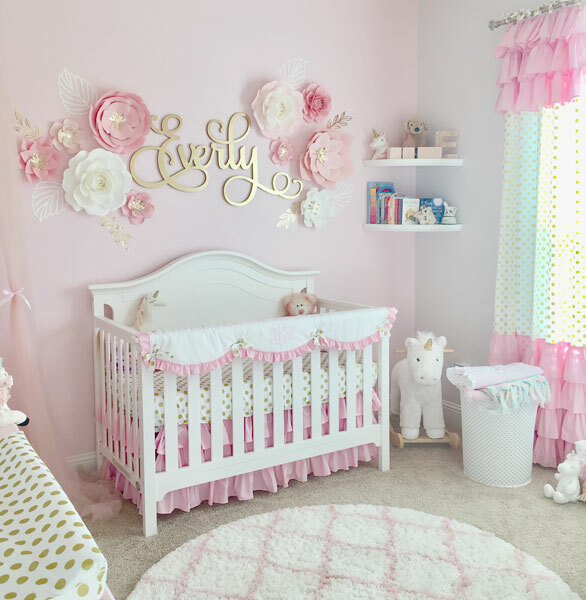 This pink and gold nursery is both sweet and sophisticated. 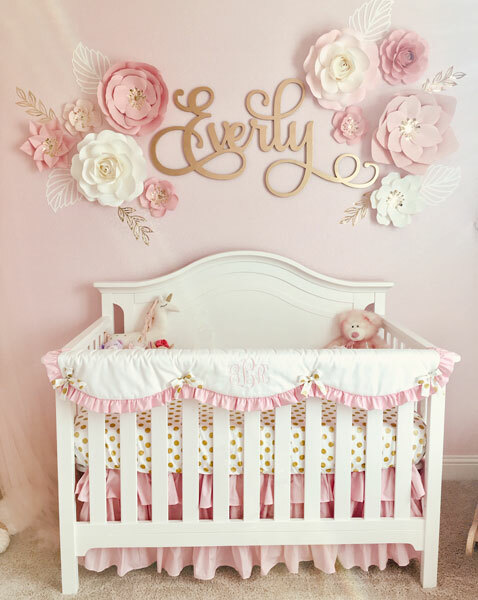 We can't seem to decide on our favorite part of the room, but the gold name plaque and assorted wall flowers are stunning, and are a perfect focal point for the nursery. Featured on the simple white crib is our Pink & Gold Baby Bedding Collection, a popular crib set for a baby girl's nursery. The gold polka dot crib sheet and 3 layered crib skirt gives the nursery bedding a feminine feel. 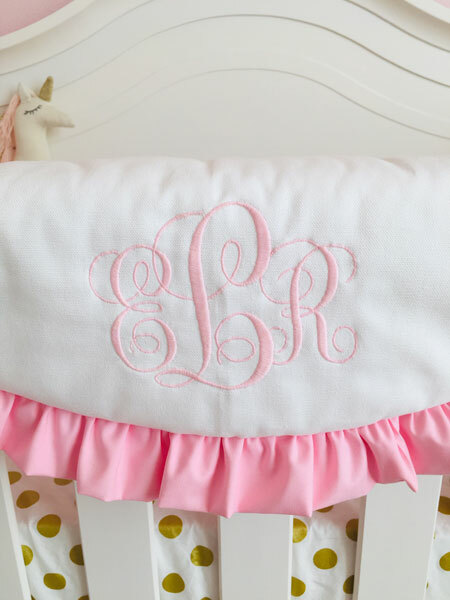 The white crib rail cover is accented with pink ruffle, gold ties, and monogrammed with Everly's initials. Because the front crib rail is wider than most, we customized the rail cover to fit by making it slightly wider. The sweet corner shelves are perfect for mementos and keepsakes. Our Pink and Gold Crib Rail Cover nursery baby bedding set is perfect for a chic baby girl's nursery! 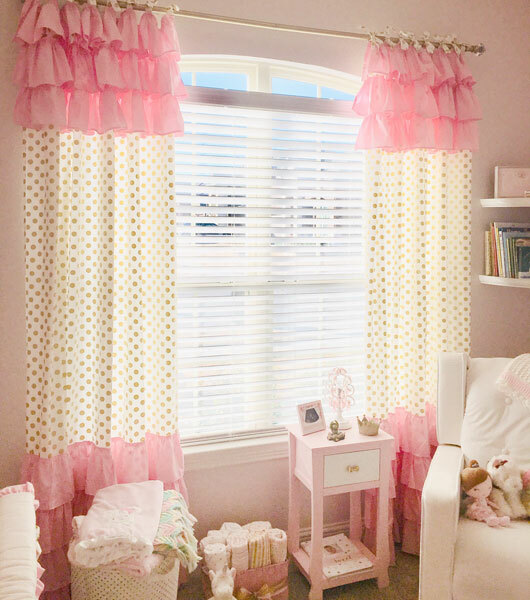 We made the custom pink and gold curtains to Nicole's specifications with gold polka dot panels trimmed with layers of pink ruffles. Our custom bedding department can work with you to design custom bedding, curtains, pillows and more! 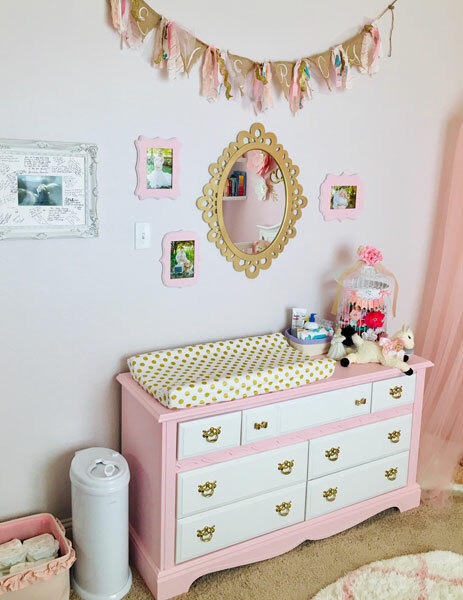 The Gold Polka Dot Changing Pad Cover coordinates with the baby bedding, and the vintage chest serves as both a changing station and dresser. The dresser's gold handles are the perfect accent! Any of our bedding products can be monogrammed with your choice of font and thread color. Nicole chose our Classic Interlocking font in Light Pink thread for Everly's crib rail cover. Thank you Nicole, for sharing this amazing room with us....We are speechless! Do you have a nursery to share? If so, we would love to see it! Please email info and pictures to [email protected].